We have lots of cool and unique Christmas Party Ideas for your kids birthday party. Or maybe you just want to throw a Kid Christmas Party. Hoo Hoo Hoo you have come to the right place. A Christmas party for children is fun and most importantly you will celebrate your kids birthday. If your kids birthday falls in Christmas plan the birthday 2-3 weeks after or before Christmas. Most friends will turn up and your kid will have a birthday party! Do you want to have a Christmas Candy Land Theme party, ask the guests to dress up as candy, or maybe you should have a Santa Clause Theme party. Ask all the guests to dress up as Santa Claus. Scroll down and check out our cool Christmas Party Ideas. Check out our Christmas Party Ideas for invitations. Make snowmen invitation cards for your kids party, it's easy and it doesn't cost much. You will need A4 sheet white card, A4 sheet of black card, felt tipped pen, silver glitter, a pencil, a ruler, brush, and PVA glue. Fold white sheet (A4), in 3 equal long rectangular sides, so your paper looks like a rectangular. Draw a snowman shape on the card, look at our picture for guides. Cut the snowman out, leaving it joint at the sides. Open up the card, and cut 2 hats from the black A4 paper, and stick them on the snowmen heads. Now use a black felt tipped pen to draw mouths, buttons, eyes and use a orange felt tipped pen to draw carrot noses, scarf's, and walking sticks. Finish it off by putting some silver glitter. In the back on the snowmen write the party Information. As mentioned above if your are going to have a Christmas Candy Land Theme party, ask the guests to come dressed up as candy, or if you are going to have a Santa Clause Theme party. Ask all the guests to dress up as Santa Claus. I promise your little princess will look really nice in her Santa Dress, so cute. You can make your own Santa dress for your kid. Get a red dress, red tights, a white belt and a Santa hat, voila! I will not give any ideas on how to decorate your Christmas tree, setting out candles, putting up lights, or other Christmas decorations which are obvious for Christmas. The Christmas decoration ideas below is more on how to decorate a Christmas Birthday party or a Kids Christmas party. Check out our cool Christmas Party Ideas for decorations, you don't have to pick all of our suggestions, pick the ideas you like most! Balloons: Hang lots of red and white balloons all over the party room. Streamers: Hang lots of red and white streamers all over the party room. Birthday Banner: Get a silver or red birthday banner with your kids name on it. This will remind guests that it is a Birthday and not only a Christmas party. Christmas Door: Wrap your doors in Christmas wrapping paper. Christmas Ornaments on Houseplants:Hang small Christmas ornaments on houseplants, it looks really nice. Christmas Lights: I know I was not going to mention this but, use your Christmas lights not only to decorate the Christmas tree, you can also decorate your garden, your house. Also, put Christmas light inside the bathroom - around the mirror, strung up along the walls or ceiling. Use your imagination. Table Centrepiece: Buy a decoration tree of steel, (party stores, eBay), and place Santa Cupcakes on the tree. It looks really nice. Or tie lots of red and white balloons together a tie them up to the chair of the birthday kid. Table Decoration: Use a red tablecloth, table ware and red or silver napkins. Decorate the table with silver or red leaves (party stores), red candy and please no candles as kids are kids. 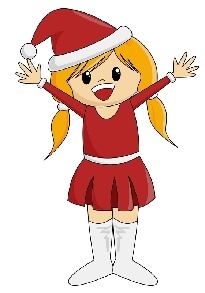 We have a whole section just dedicated to fun Christmas Party ideas for games & activities and Christmas crafts. Before you click away to our games or crafts ideas, please finish reading our Christmas Party Ideas. We have lots of fun Christmas Party Ideas below on food, cake and more. But if you can't wait, check out our Christmas Party Games or Christmas Crafts now by clicking away. For a Kid Christmas Party the best thing is to make finger foods. The kids will eat lots of Christmas food at home so we have a more modern menu. Have a look at our yummy Christmas Party Ideas for food & drinks, below. Christmas Mini Burgers: Make mini burgers, kids love to eat them. Christmas Hotdogs: Serve small hotdogs or cut the normal ones into two pieces, serve this with bread. Christmas Sandwiches: Make turkey/ham sandwiches and using a Christmas cookie cutter cut them into Christmas shapes. Christmas Cupcakes: Make cupcakes and decorate them with red or gold icing - make Christmas Stars. Christmas Cookies: Make sugar cookies and let the kids decorate them. Christmas Snowmen: Make snowmen out of peanut butter and powdered sugar. Hot Chocolate: Serve hot chocolate with whipped cream. EggNog : Goes with the theme. Drinks: Don't forget to offer lots of water and soda. The easiest way to make this cake is to buy a Santa Clause cake pan. You can find cheap ones at eBay. The frost the cake with red and white icing. It's really easy and it looks nice. Make our buy yummy cupcakes, frost the cupcakes with white icing, use a flat knife to smoothen out the icing. Then around the white icing frost with red icing - the hat. Curve it around the side of Santa's face. Sprinkle some coconut to Santa's face to make Santa's bear and hair. Use blue gel icing to form his eyes and pink gel icing to form his cheeks. Finish it off by adding a red small m&ms nose. At the start of the party take a picture of all the little Santa's together. If you are using a digital camera add a Christmas border around the picture (with your computer), and email it to all the guests or post it, with a small note. If you know of any cool Kids Christmas Party Ideas (on costumes, invitations, decorations, cakes, food etc) that you would like to share with us and others, please Party It Forward. It's nice when fellow parents share their party ideas and photos with us and other parents. This of course helps this site to grow and gives more free ideas to parents like you. Or maybe you don't, but surely you will have some ideas after reading our Christmas Party ideas, please send us some pictures of your party (costumes, invitations, cake etc). We would love to put them in this website.